Light yet strong, durable polyester material. Measures 3'x5'. Brass spur grommets. Made in Taiwan. 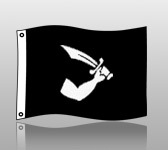 Infamous pirate Thomas Tew flew this flag over his ship. The muscular sword gripping arm was designed to make it clear to others that this was a pirate ready for action.